Have you been noticing signs of something that looks or feels like it may be a cavity and fillings are needed? How can you tell if something strange-looking on your tooth enamel is a cavity or something else? Often, if you haven’t had a cavity before, or if it has been a while, it can be tough to tell whether what you’re experiencing is serious or not. Dental caries, the scientific term for tooth decay and dental cavities, can take a few different forms, depending on their location and severity, but they often appear as discolorations, dark spots, or holes in the hard surface of your teeth and almost all ultimately need fillings to save the tooth. What is happening is that the crystals making up the outside of your tooth are starting to be dissolved by the acid the bacteria growing there are producing when they feed on the sugars and starches in your mouth. Dental plaque and lesion forms and when the bacteria and inevitable decay starts breaking through the enamel into other layers of the tooth, you have what is called a cavity. You might experience some pain or sensitivity, especially when taking a bite of a hard, tart apple, digging into a piping hot dish of lasagna, or slurping from a chilled banana smoothie. When a dental cavity goes as deep as the nerve below the tooth, this is when you’ll start feeling some sensitivity to certain foods and drinks. Dental caries can be mild at first, flying under the radar—often they aren’t so annoying that people come to see a dentist in right away, though this is advisable. The longer you leave a cavity, however, the more harm it is likely doing to your teeth and the longer it may take to get rid of. For some time after the cavity first develops, your mouth still may be able to heal itself. We’d recommend that you make an appointment with your dentist as soon as you notice that something is wrong. Sometimes, your dentist will take an X-ray at this point to determine the exact location and extent of the damage to your teeth. Treatment may involve placing a coating on molars that are showing some signs of decay if the decay is still on the surface of the tooth. If not, the dentist will administer a tooth filling. If the tooth decay and dental plaque has got out of control and has reached the tooth’s pulp, root canal treatment might be required to prevent the decay from spreading. If the decay is left unchecked through and there is a lack of oral hygiene, the entire tooth may be slowly destroyed, and an abscess might develop, leaving you at risk of a nasty infection. Some people use oil pulling to help with cavities (swishing olive, sesame, or coconut oil in their mouths daily, for twenty minutes at a time, in addition to brushing and flossing) while others stick to a regular tooth cleaning regimen and biannual trips to the dentist. There is a huge variety of natural ways to care for your teeth that you can check out online, though you may want to run these options past your dentist first. This oral hygiene treatment gel helps with pain sensitivity and the overall health of your tooth. It gradually creates a protective layer over your teeth that dampen the impact of acidic, hot or cold, or sweet food, so that you can eat without your teeth hurting. The fluoride toothpaste helps prevent cavities from forming in the future. Users found this gel to be an excellent first line of defense and one that was easy on delicate teeth. Some users didn’t like the consistency of the gel but found that its ability to strengthen the teeth’s enamel and remineralize the teeth made up for any wateriness. Another great first line of defense, this anti-cavity gel is affordable and effective. It’s able to neutralize the acids that can cause cavities—all while helping improve your breath and to keep your mouth from drying out. This gel helps remineralize tooth enamel as well, with Nano hydroxyaoetite, and it also contains xylitol and sodium fluoride, which will help protect your teeth from cavities. It’s a good option for those looking for a pleasant-tasting, non-abrasive tooth gel. And you can even buy one for your kids—it’s meant for ages three and up. Users loved the minty flavor and found that they could see and feel a huge difference in the cleanliness of their teeth after using the toothpaste. Another cavity protector, this toothpaste will not only keep your breath smelling fresh, but it will also add a layer of protection to your teeth and your roots so that cavities are less likely to begin growing in the first place. Users liked the taste and found this to be an affordable option when it comes to daily brushing. 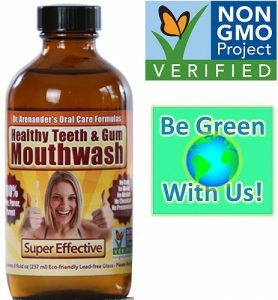 This mouthwash helps prevent gum disease, abscesses, plaque, and bad breath. It comes in a peppermint flavor, which is quite powerful but easy to get used to you (users found it grew on them the more they used it). We love that this mouthwash contains aloe vera and that all ingredients used in it are organic and non-GMO verified. This product can help reverse the effects of gum retraction and can help make your gums feel better if you’re noticing soreness or redness. With a combination of techniques from modern medicine as well as Ayurvedic medicine, this product is an interesting mix of natural components (including sage, rosemary, basil, Himalayan rock salt, something they call Primordial Plant Minerals, Tea Tree oil, and cloves. You can also use this for oil pulling. These are a few of our favorite products out there when it comes to preventing and easing the symptoms of cavities. The key to oral health is consistency, accountability, and the willingness to continue learning about your oral health as you grow older. If we treat our teeth well, they’ll continue to enhance our quality of life for years to come.